Why is belly fat bad for your heart? Fat deposited around your middle — also called visceral fat — lies inside the abdominal wall, surrounding key organs. This firm fat is a different animal from the fat covering legs and buttocks. Visceral fat is dangerous because it is metabolically active — it directly impacts your body chemistry. In contrast, the fat padding our thighs and behinds is warehoused until our bodies need to burn it for energy. Visceral fat wraps around your liver, interfering with insulin production and promoting diabetes, a strong risk factor of heart disease. It lowers healthy (HDL) cholesterol while raising your lethal (LDL) cholesterol. This encourages the accumulation of sticky plaque on the walls of your heart’s arteries. Belly fat pumps out hormones and proteins, promoting inflammation, a major contributor to many health problems. When hidden plaque becomes inflamed, it can burst. Platelets and blood-clotting molecules drawn to the site form a plug that can block the artery walls and cause a heart attack. Belly fat has also been tied to mood. Recent studies link its presence to depression. How do men and women measure up? Most women collect fat around their hips and buttocks, developing a "pear shape," while most men collect it around their bellies, developing an "apple shape." So men tend to accumulate more visceral fat. 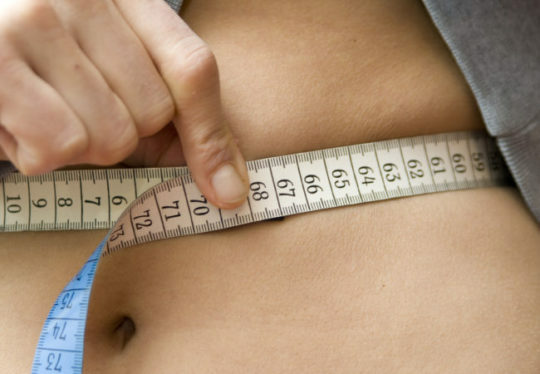 To find out the kind of shape you’re in, calculate your waist-to-hip ratio. Measure your waist where it is narrowest and your hips where they are widest, then divide the waist measurement by the hip measurement. If you’re male and your waist-to-hip ratio is above 1.0, or female and your ratio is above 0.8, you’ve got an apple shape and are at greater risk for heart problems. The good news is that exercise can work wonders in trimming girth. Take a brisk walk just 30 minutes a day, five days a week, to help stop the growth of visceral fat. Increase your exercise by jogging or doing another aerobic activity – with your doctor’s blessing, of course — and you’ll actually see your waistline shrink. Visceral fat is some of the first to go when you start aerobic exercise. Most of all, if you haven’t developed an apple shape yet, start exercising now and enrich your diet with plenty of fiber.